December 3, 2018 – In this episode, our time machine turns Zamboni and hits the ice for the greatest fanned shot in sports marketing history, when the New York Islanders — a decade removed from their four-in-a-row Stanley Cup dynasty of the early ’80s — chose a new mascot that resembled nothing so much as frozen food pitchman The Gorton’s Fisherman. 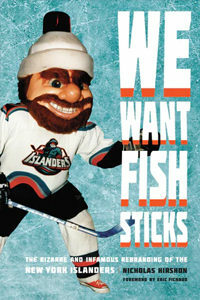 Joining us to do color commentary is our friend Nicholas Hirshon who brings us We Want Fish Sticks: The Bizarre and Infamous Rebranding of the New York Islanders . We last heard from Nick when he invited me to conduct a live interview at the Joint Journalism and Communication History Conference at NYU’s Arthur L. Carter Journalism Institute. Our guest that day was Ephemeral New York’s Esther Crain who chatted with us about her book, The Gilded Age in New York, 1870-1910. Nick Hirshon is assistant professor of communication at William Paterson University and a former reporter for the New York Daily News. You’ve seen his work in the New York Times, the Wall Street Journal, and the Hockey News. His previous books are Nassau Veterans Memorial Coliseum — the arena where the Islanders built that dynasty — and Forest Hills, about his Long Island hometown, with a forward by actor Ray Romano. *Signing will continue throughout televised coverage of the Islanders’ away game against John Tavares and the Toronto Maple Leafs. *Signing will precede the Islanders-Rangers game at Madison Square Garden a block away.